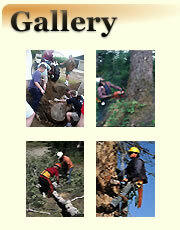 DOES YOUR TREE SERVICE HAVE PROOF OF INSURANCE? That old oak tree has been in your back yard since the kids were born. Now they're grown and moved on, and that tree has seen better days. Can it still be saved, or is it posing a threat to you and your personal property? The latest round of storms split your elm tree into two pieces, sending the largest one through the roof of the house. How are you going to remove it without causing further damage? Your company just won the contract to develop the community's newest subdivision. And about 300 trees lay in your way of getting started. Who'll help you get off on the right foot and clear those trees and stumps?